BRUSSELS: The European Union and Canada signed on Friday a free trade accord after more than four years of sometimes difficult talks, a huge deal that both said will boost growth. 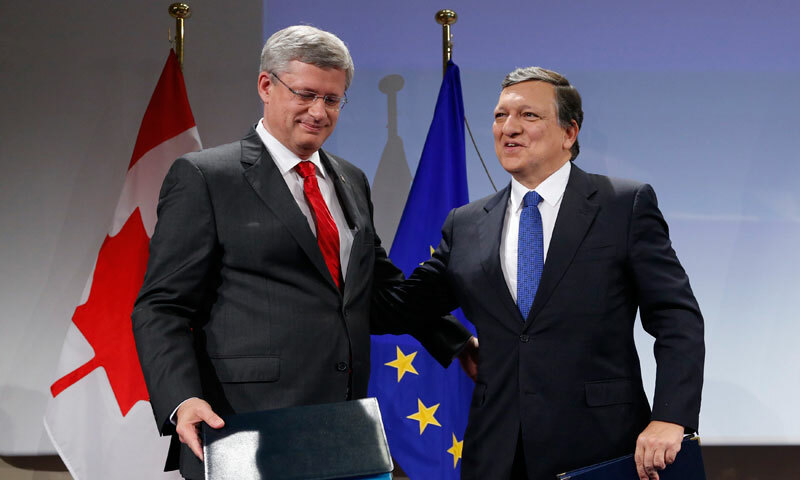 �We have taken a crucial step forward in strengthening relations between the European Union and Canada,� the European Commission said while Canadian Prime Minister Stephen Harper hailed �the biggest (trade) deal our country has ever made�. �This is a highly ambitious and far-reaching trade agreement of great importance for the EU�s economy,� said Commission head Jose Manuel Barroso. It would provide new opportunities for companies in the EU and in Canada by increasing market access and �be the basis for gaining a strong foothold in the North American market and so provide a catalyst for growth and the creation of jobs in Europe,� he said. The accord is widely seen as a possible template for EU efforts to conclude a similar Transatlantic Trade and Investment Partnership with the United States. Harper said the agreement in principle with Brussels -- there remain technical details to be resolved -- was �the most important ... and most ambitious ever� for his country. �It is not just a good deal, it is an excellent deal,� he added. It will give Canada access to a market of some 500 million people in the EU, making it bigger even than the landmark North American Free Trade Agreement (NAFTA) with the United States and Mexico.